We no longer collect honey bee swarms or remove colonies from buildings, but we have included some useful information that may help you. There is a difference between honey bee swarms and a resident honey bee colony. Let's establish what you have! A honey bee swarm consists of one queen bee and many worker bees. Unlike a honey bee colony, they have no permanent home or nest. A swarm is formed when a colony gets too big or runs out of space to hold more workers. The original queen takes some worker bees and leaves the nest/hive to form a new colony elsewhere. The bees left in the original nest/hive will raise a new queen. Some colonies swarm multiple times in one year. 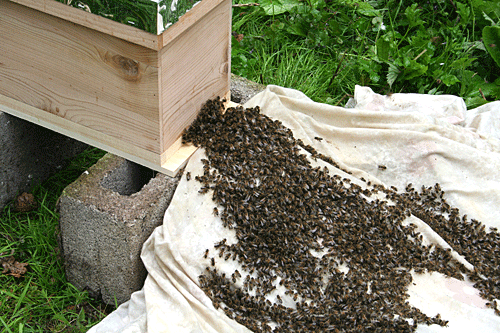 A swarm can arrive in your garden almost out of thin air. There are no warning signs. They can also disappear almost as quickly as they arrived. 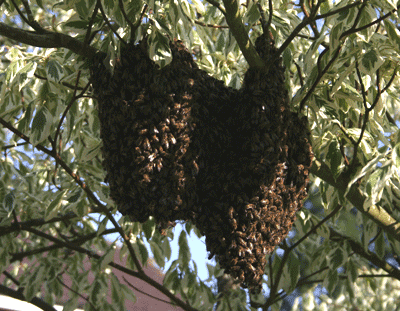 Generally, a swarm will land on a branch or sometimes on the side of a building. The queen will be in the middle of the swarm. At this time the bees are homeless and are looking for a suitable place to set up home. It usually pays to wait a few hours before calling someone out to remove a swarm, as the bees are likely to leave on their own. When bees swarm in this fashion, they have no home or nest to protect or defend and are generally happy! They will have also gorged themselves on honey before leaving and are full, making it hard for them to sting. So, they are at their least likely to sting. However, as with all potential stinging insects, it is better not to interfere with them without the correct protective clothing. A honey bee colony is an established nest of bees that have a working honeycomb with stores of honey and young bees. Honey bees can and frequently do nest in buildings. Chimneys, roof spaces and cavity walls are favourite places for them to establish a working honeycomb. The comb is made by the bees from wax and has two functions. The function of the honeycomb is of course to store honey, the incoming nectar once inserted into the comb evaporates and when ready the bees cap the individual cells off to keep the honey fresh and to stop it drying out and hardening off, this honey is then used in hard times of food shortage and over winter. The second function of the honeycomb is to provide somewhere for the queen to lay her eggs and also to provide a nursery for the young bee larvae. A honeycomb built in a house (usually in a chimney), even if the original builders have gone, is a potential attractant to other bees. The smell of the honey stores and also the beeswax can draw swarms from some distance away. If you wonder why you get a swarm of bees turning up every year, or you appear to have bees nesting each year, it is likely you have a honeycomb present somewhere on your property (probably a disused chimney). It is important to note that bees do not hibernate in the same fashion as wasps. They store food (honey) to keep them going over winter. A colony can remain active in the same place year after year. During winter you may not see the bees outside as it is too cold for them to fly, but they will still be alive and huddled in the warm waiting for spring. 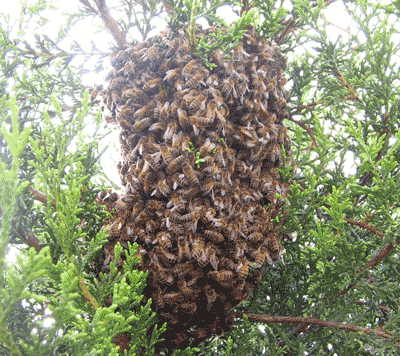 If you have a bee swarm, do not panic, get in touch with your local beekeeper's association, and they will arrange to come out and collect the swarm and remove it. The whole operation is relatively quick and fuss-free! Beekeepers are usually more than happy to collect and rehome a swarm. Sometimes a swarm of honey bees will establish a new colony within a building; this can be someone's home or another equally unsuitable place! If this happens and the colony decides to stay, if they cannot be extracted and the homeowner cannot live with them, then sadly the only course of action is to destroy them. Note: We do not treat any bee species. 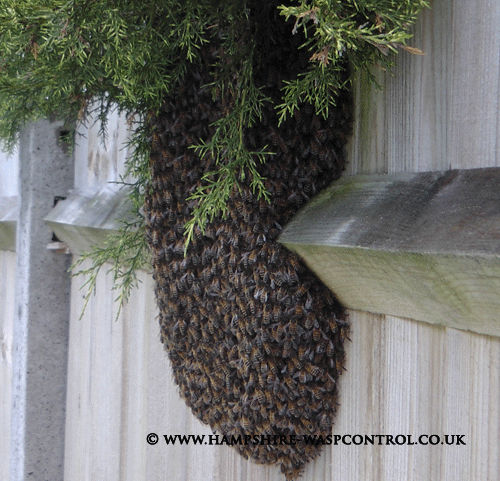 If you have a swarm arrive and get into an awkward place, please give it a day or so before taking action, often they will decide to move on. If the bees decide to stay, we suggest you get in touch with your local beekeeping association to discuss your options. Mason bees and Mining Bees. Mason bees are solitary bees which are often mistaken for wasps in spring. They are beneficial insects, and we would encourage you to leave them alone. They emerge mid-spring and will be around for six weeks or so. Once they have mated and laid eggs, they will disappear. If you have mason bees one year, it is likely that you will get them again the following year, this is a good thing! Mason bees favour small holes such as disused holes in brickwork and the little plastic weep vents built into modern brickwork. They will also lay eggs into gaps around PVC windows and doors; the tell-tell signs are mud/sand packed tightly around window or door crevices, or mud packed into the holes in air bricks or old holes in brickwork. Only female bees can sting. Mason bee stings are very weak. They are very unlikely to sting unless you were to accidentally squash or harm one. Mining bees, similar to mason bees are beneficial insects, very unlikely to sting. Mining bees burrow into the ground, making small holes just slightly larger than wormholes with a little heap of soil on the top, resembling a mini volcano. We do not treat any bee species. Mining bees and mason bees are harmless and very unlikely to sting. Only female mason bees can sting, and their sting is very weak. You may not even notice being stung. 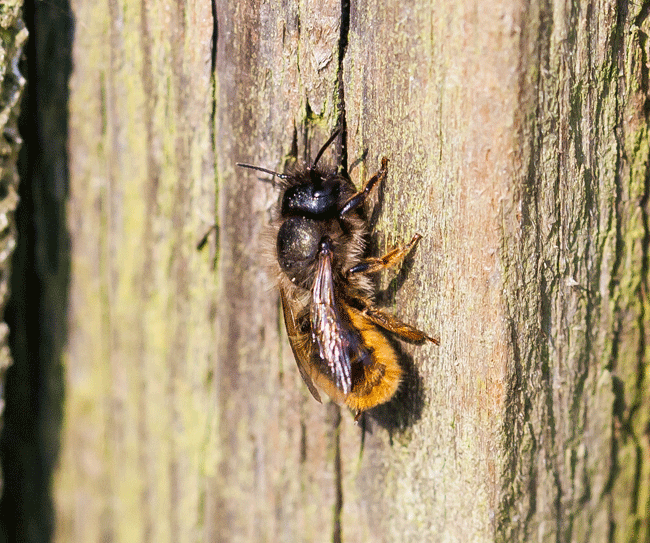 If you have mason bees, either leave them alone as they are a beneficial insect, if you cannot live with them you will need to have your brickwork re-pointed by a builder or any holes which they are using need to be blocked. 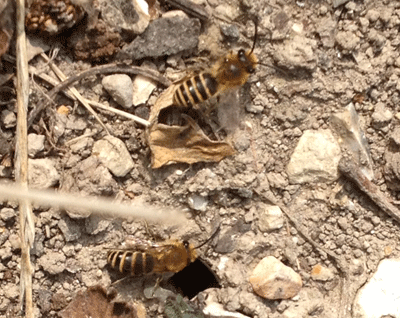 If you have mining bees burrowing into your lawn, leave them alone, they will soon be gone.